February is the Everett Public Library’s 4th annual, month-long Everett Reads! celebration. All of Everett is invited to read the same book. This year the selected title is Maria Semple’s bestseller, Where’d You Go, Bernadette?. Semple comes from a Hollywood writing background, having been a writer for Mad About You, and a producer on Arrested Development. Her writing reflects the quirky humor of both shows. Bernadette is set in Seattle, where Semple currently resides. Boing Boing’s founder and editor-in-chief Mark Frauenfelder describes the book as a “funny and dark novel about the disintegration of a Microsoft family”. It’s a book we think that you will enjoy talking about, and Semple is a humorous and engaging speaker who we think will capture your interest. Maria Semple will be at the Everett Performing Arts Center in a free appearance and book signing at 7 p.m. on Sunday, February 23rd. There are two book discussion opportunities, 6:30 p.m. on Wednesday, February 12 and 11:45 a.m. on Monday, February 24 (both at the Main Library). We hope to catch you reading Where’d You Go, Bernadette? in February! “Groundbreaking Reads” is the theme for Everett Public Library’s 2013 Adult Summer Reading Challenge. Groundbreaking books of the reader’s choice, including fiction or nonfiction, new or not-so-new releases, can be explored. Or if you prefer, pick up some music CDs, a movie or an audio book. The library has them, as well. Registration began June 1. The program is open to those age 17 and older and will run through August 31. Visit a local branch library to register and pick up a book log. More information about the challenge is on epls.org/asr. Don’t forget about the prizes! After reading your third book, you are eligible to receive a 2 for 1 coupon for Bookend Coffee Co.
After reading your seventh book, you are eligible to receive a Friends of the Library tote bag. If you want to share your thoughts on the books you’ve read this summer, you are encouraged to submit short reviews. You can get book review forms at the main library or the Evergreen branch as well as online. We will publish select reviews right here on A Reading Life (as well as on the Everett Herald website). Book reviews will be accepted at all library branches June 3 through Aug. 31. Getting the Dirt on Dirt: 10:30 a.m. Saturday, June 22nd – All dirt is not created equal. Learn what it takes to maximize the growth potential of your soil. Master Gardener Sandy DeLisle will show you how to create compost from yard or food waste. One lucky participant will take home the demonstration worm bin. Sponsors for the 2013 adult summer reading challenge include: Friends of the Library, and Bookend Coffee Company. It’s 2013, and it’s almost February. Time for Everett Reads!TM 2013! Those of us with pets often wonder what it is our pet is thinking. What do they perceive about us? What do they perceive about the world? This year’s read is a playful exploration of that concept, yet it delves into almost every one of life’s dilemmas, frustrations, and celebrations. 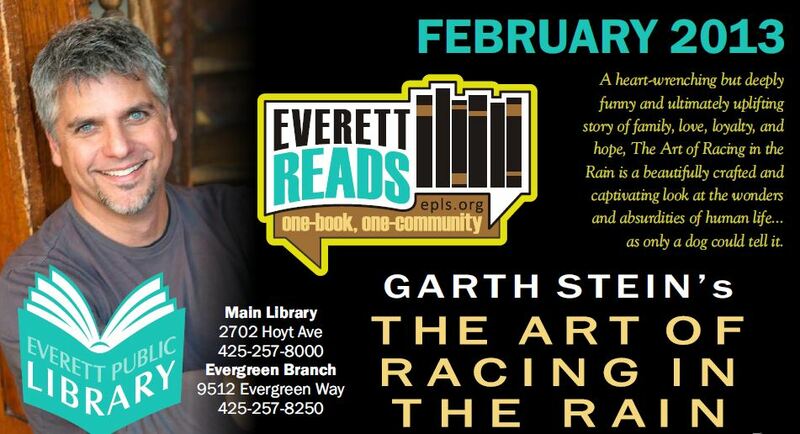 This year the Everett Public Library brings Garth Stein and his two books The Art of Racing in the Rain and Racing in the Rain: My Life as a Dog (the latter his “tween” version of the book) to Everett. Following a month of engaging programs designed to enhance the experience of reading the book, Stein will appear in Everett on March 8th, 2013. At 2 p.m. he will meet exclusively with teens/tweens at the Main Library, 2702 Hoyt Ave. The all-ages marquee event is at 7 p.m. and for the first time it will be held at the Historic Everett Theatre, 2911 Colby Ave. Like all library events, these are free and open to the public – though you might want to arrive early to assure a seat at the Historic Everett Theatre. Before Stein gets here, you’ll have a chance to meet Zep, one of Everett Police’s K-9s on Saturday, February 16th at 2 p.m. in the Main Library Auditorium. In addition, the library is hosting a dog adoption event with the Everett Animal Shelter, hosting a book discussion, film screenings, and other author events. Take a look at our flier to view all the great programs. And just in case you want to read more, we have a list of complimentary titles ready for you right in the library’s catalog. Whether you want to download the audio or text version or check out any of the 3 different editions (it’s available in paperback, large print, and audio cd), the library has a copy for you. What are you waiting for – go meet Enzo (and his owner). Actually, I do have more to say about Louder than a Bomb. I didn’t know what to expect from this documentary – the poetry slam movement erupted in the 90’s, and I wasn’t sure this wouldn’t be a tired retread of that topic. Also, this is an Oprah Winfrey Network film; that, too, made me skeptical. I found myself continuously undertaking a “am I being manipulated” litmus test while watching, because it does tear at your heartstrings in every possible way. However, I have concluded that even the most sap-resistant viewer will be taken in by this film. This is the story about the journeys of the 2008 Chicago-area high school teams going into the annual Louder than a Bomb competition. Upon further research, I discovered that Chicago is actually the birthplace of the poetry slam – perhaps that is why the movement is still so vibrant there. In the film we meet key players from each team, and learn about their varying degrees of hardships and what it is that brought them to poetry. But thankfully it is the poetry itself that is the most provoking. Unlike traditional coffee-house open-mike poetry readings, poetry slams feature many approaches to poetry, and much of what’s highlighted here resembles (to my ear) hip-hop. In fact, in my inner dialogue I began to question whether this was actually poetry… which led me to question my perception of poetry generally…see where I’m going with this? Indeed, poetry slams are not without their critics (as this Wikipedia article points out, Harold Bloom called them “the death of art”). One of the troubling aspects of slams, assigning points to poetry, is demonstrated in the film when the reader of a powerful piece momentarily misspeaks and is docked what turns out to be the difference between winning and losing. I personally concluded that I don’t care if what we are seeing here is poetry. I want to support a movement that is so positive for teens, emo and gangsta alike. Watch this film and see what you think. I’ve played sports for much of my life but I would not consider myself a “jock”. That’s one of the reasons the above-referenced Lonely Island lyric, from the album Incredibad, cracks me up every time I hear it (the visual is even funnier, watch the video here). I’m not a sports fan, but I love a good game. And so I love a good sports film. Most people are familiar with the classic sports films such as The Bad News Bears, Field of Dreams, Miracle, The Natural, Hoop Dreams, maybe even the more recent films The Fighter and Million Dollar Baby. I’ve seen The Hustler and Raging Bull on some lists of great sports films, but I myself would not deign to pigeon-hole them as sports film…but I digress. There are three sports documentaries that have been released within the last 5 years or so that you may have missed, and are well-worth a watch. My favorite of the three is the documentary Harvard Beats Yale 29-29. The film contains a fascinating amount of original footage depicting the drama of a notorious 1968 football game, played in the midst of anti-war conflict, resulting in a headline from which the film title is drawn. I loved this film partly because it gave me insight into the culture of the two schools (who knew that Harvard considers themselves a working class school, in opposition to Yale’s school of bluebloods?) and the it’s-a-small-world insight into George W. Bush, Al Gore, and Tommy Lee Jones’ backgrounds; but there’s plenty of other drama to the story to keep you interested. Close behind Harvard Beats Yale is a local story, a documentary about the intense rivalry between Seattle’s Garfield and Roosevelt Girls Basketball teams titled The Heart of the Game. This movie is at once inspirational, sad, heart-pumping, maddening and reflective. The third is a film I’d only recently become aware of called Senna. Senna, a well-to-do Brazilian, was/is a legend in Formula One racing. If I’ve started to lose you here, I understand – but try to hang on. This documentary is about old-school car racing, when driver skill (and not vehicle technology) made all the difference in a race. The footage is all original, from the 1970’s and 1980’s, and the filmmakers do a fantastic job illuminating the tension amongst Senna and his career-long arch nemesis Alain Prost. Huge egos battling each other… and battling it out at alarming speeds – it’s incredible to watch. As any fan of sports film knows, most great sports films are about so much more than the sport they portray. Many tackle complex social issues that incorporate socio-economics, race, and gender. Sadly, many good films are made and never make it to distribution. One such film that I had the opportunity to see is a 2001 documentary Rocks with Wings, about a girls basketball team in Shiprock, NM. The team is made up of Navajo girls, and their coach is a black 24-year-old male. If you ever have a chance to see it, I recommend it! In case you haven’t heard, our 2012 Everett Reads! author is Sherman Alexie. From his large body of work, we’ve chosen his National Book Award for Young People’s Literature winning The Absolutely True Diary of a Part-time Indian as the focus for this year’s program. For many people Alexie first appeared on their radar with 1998’s film Smoke Signals (Alexie wrote the screenplay, based on his 1993 novel The Lone Ranger and Tonto Fistfight in Heaven). This was America’s first glance at Alexie’s accessible yet poignant humor and unique perspective on American Indian history. Absolutely True has endured since its original publication in 2007, and copies fly off the shelves at bookstores and libraries alike. Alexie’s often humorous-yet-serious insight into social issues, familial issues, teen angst, American Indian and popular culture continues to resonate. Alexie is a renowned speaker, best known for his dry humor and honest, genuine style. He is also an accomplished poet, having won several prestigious poetry awards. His work is also enjoyed by a wide-ranging age-group, and initially, this was one of the primary reasons we selected Absolutely True. Just a few months ago the library celebrated the grand-opening of its long-awaited Teen Zone, a space just for teens in the Main Library, and we wanted 2012’s Everett Reads! to compliment this momentous improvement. Alexie was the perfect choice. There are so many great things that can be said about Absolutely True and Alexie’s accomplished body of work. But don’t take it from us, instead come discover them on your own. To aid you we’ve scheduled a series of events and speakers that will bring out Alexie’s many talents and that will hopefully inspire discussion throughout our community. The fun starts this Saturday, February 4th at 7 pm with Alexie’s visit to Everett’s Performing Arts Center. After being inspired by the author, be sure to check out the other programs throughout the month of February. These include a fine selection of films, book discussions, programs on local tribal history, and, of course, a program about cartooning. If you’ve ever listened to an audiobook, you probably know that a great narrator can give us a wonderful listening experience (and worse, a poor narrator can ruin a book altogether). When you are looking for your next book to read, you have a variety of methods to choose from, like talking to friends, librarians or searching web resources for recommendations. Though the format is different, the options are similar when you are looking for your next book to listen to. Mary Burker of the publication Booklist is an expert and writes a blog called Audiobooker—a great place to start searching for your next audiobook. No matter whether you listen to audiobooks to pass the time while commuting or doing housework, to learn more about a given topic, or just because you are a person who enjoys listening to books, the resources available from AudioFile, a print magazine and also an online resource, are invaluable. AudioFile provides reviews of audiobooks and narrators throughout the year. AudioFile also produces the industry-standard awards for the best audiobooks each year. June is National Audiobook month, and the 2011 Audie awards have just been announced—why not give a listen? Life by Keith Richards (read by Johnny Depp and Joe Hurley, featuring Keith Richards) won audiobook of the Year. The Immortal Life of Henrietta Lacks by Rebecca Skloot (read by Cassandra Campbell with Bahni Turpin) won for best non-fiction audiobook. Winter’s Bone by Daniel Woodrell (also an award-winning film), won best fiction audiobook. There are many other categories and nominees to explore. As they say in the audiobook community, get caught listening!